The Echinocereus is closely related to the popular Echinocactus. Mostly native to the southern United States and Mexico, there are about 75 species of this pretty little cactus, a few of which sometimes find their way into garden centers. To further confuse you, they are often called hedgehog cactus, a name that is sometimes applied to other squat, globular cacti, not in the Echinocereus genus, such as the Echinopsis. Among cactus growers, Echinocereus are known for being a bit easier than some of their fussier cousins. Some members of this genus can be found far to the north, growing in quite cold areas. Echinocereus have a very wide range of shapes and sizes, ranging from small balls with spines to thin columns. Like other cacti, the Echinocereus have beautiful flowers. Light: Echinocereus need bright light to perform their best. If you can provide nearly full sun, as in a western window, they will appreciate it. Plants that are grown in dim conditions are unlikely to flower well and will not thrive. Although these are cold tolerant, most of the popular species need relatively warm temperatures to grow their best. Water: Good drainage is essential for health. During the summer, water the cactus every two weeks or slightly less often, depending on how moist the soil remains. In the winter rest period, cut watering back to once a month, or in humid areas, not at all. Fertilizer: During the summer, regular doses of a cactus fertilizer will help it grow its best. Use diluted fertilizer for best results. Soil: A typical cactus mix is perfect. Some references say these plants can handle a slightly richer soil than other types of cactus, but it's never a bad idea to err on the side of caution. Echinocereus can be propagated either through offsets or by seed. To take an offset, remove the small plantlet, then let dry until callous forms on the cut. Carefully plant the cutting in a cactus soil and keep warm and just barely moist under new growth emerges. These plants can also be reproduced from seed. Plant the seeds in a shallow mix and keep them warm and slightly damp. Germination takes place in about two weeks. Echinocereus are slow growing cactus that should only need repotting every other year or so. You can prolong the time to repotting by removing plantlets and potting them up in their pots. When repotting a cactus, carefully remove it from its pot and knock away any clumped soil. These plants tend to be shallow-rooted with weak root systems, so take care not to damage their roots. E. acifer. A globular species with deep red flowers. E. brandegeei. A clustering species with pink flowers and long spines. E. stramineus. With large pink flowers. 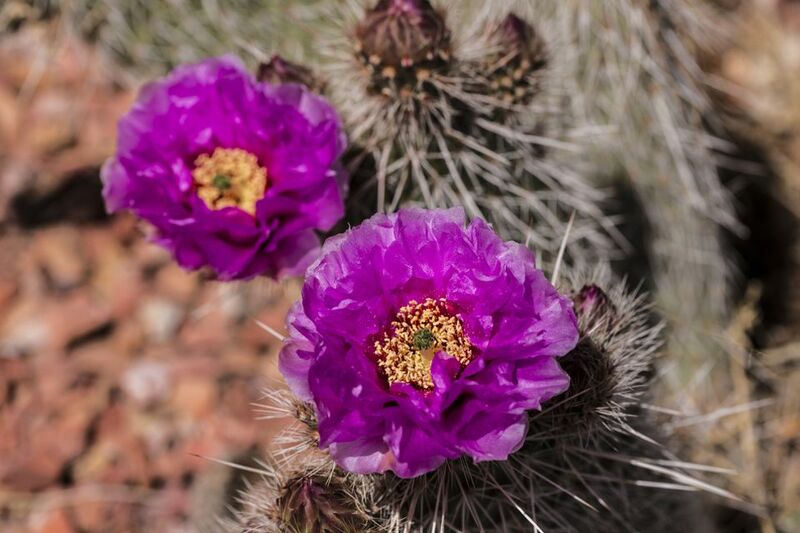 You might see Echinocereus in a garden center labeled as Claret Cup, Strawberry Cactus, Hedgehog Cactus, or Calico Cactus. Unfortunately, however, one of these names does not guarantee the plant in question is an Echinocereus. If you can successfully grow other globular cacti, you can most likely grow Echinocereus well. One of the key factors in success with these is avoiding any hint of wet soil. Because their root systems are weak, they are especially prone to root rot, which will eventually kill your plant. Otherwise, they thrive on a program of strong, bright light; slight water; and a steady diet of light fertilizer. Echinocereus is vulnerable to mealybugs and aphids.